What Goes Into a Car’s Auto Repair? What goes into a car is a very vague question. One could argue that you go in a car. Groceries go into a trunk. Many different things can go in a car, but not as many go into making a car drive. For instance, oil, coolant, and gas are all liquids that go into a vehicle and serve very different purposes. Too many people think gas and oil are the same thing and both act as fuel. As any auto repair in Milford NH could tell you, this is not the case. Here is a breakdown of three of the liquids that go into a car and what they do. Oil and gas are not the same things. Oil is in no way a fuel source for your car and confusing the two can do severe damage to your vehicle. Oil goes in the engine to lube up the works. You may have heard of a dipstick before. The dipstick is used to measure how much oil is left in your car. It’s important to keep enough oil in your car to prevent gears from grinding against each other and damaging your engine. Coolant, as the name suggests, keeps your engine from overheating. Also known as antifreeze, coolant is a mixture of water and alcohol that circulates to the car’s radiator as it absorbs the heat from the engine. Coolant is essential to your car’s well-being because cars can’t operate when they overheat. Gas, short for gasoline, is the fuel source for automobiles. Assuming it isn’t an electric car, gas is what makes your car move. There are different kinds of gas that are better for different types of vehicles. If your vehicle doesn’t explicitly require premium gas, the best route to take is regular. It’s a bit cheaper and will act just the same as the premium in the typical automobile. If you aren’t sure what kind of gas your car requires, ask your local auto repair in Milford NH. 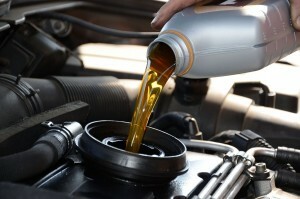 Oil, coolant, and gas keep your car running smoothly. When people think of cars, their first thought consists of engines and horsepower. It’s easy to overlook the liquids that make a car go, but remember to keep on top of your oil levels and not to run out of gas. For any questions you may have on auto repair in Milford NH, contact Gurney’s Automotive Repair today or visit them online.